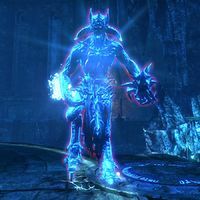 The Simulacrum of Molag Bal is a ghostly aspect of the Daedric Prince Molag Bal. He will appear at the conclusion of the Barathrum Centrata event in the Imperial Sewers, after all three central portals have been closed. When killed, he can drop several Trophy Vault trophies, a Hakeijo rune, a Sigil of Imperial Retreat, or very rarely a Stonefire Scamp pet or Soul-Shriven Skin costume. A maximum of twelve players can loot the Simulacrum; if more than twelve take part in the final battle, some participants will get nothing. The Simulacrum deals a large burst of damage upon death. Healing quickly after this explosion is essential if enemy players are around. The drop rates for the rare pet and skin were doubled during the 2016 Planemeld Palpitation event and the 2017 Imperial City Anniversary Event.